Join Us!!! We are looking for someone to help us cover Marshallese basketball. Please send us an e-mail. Lae fly again. The Bank of Marshall Islands 17th Ralik Ratak Shootout declared both Lae teams tournament champions following back-to-back epic finales against top women's contenter AUR and a strong Kwajalein team from the men's division last Wednesday. Both Lae teams maintained an undefeated record throughout the event. In the women's division, Lae held a 10-point lead before the buzzer went off, ending the game at 68-58. 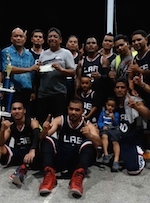 In the men's division, Lae, had its most difficult finals challenge ever with an aggressive Kwajalein team that pushed the title game to overtime before succumbing to Lae by a single point, 76-75. In total, thousands of basketball fans in Majuro, Ebeye and across the US, plus the superpacked Staff Sergeant Solomon Sam Sports Center at the College of Marshall Islands viewed the event as it unfolded. Marshall Islands Basketball Federation (MIBF) and School Enrichment Program from the Public School System team up with Majuro Atoll Local Government to run a Middle Schools Christmas Friendly Games for boys. This year a team from Pohnpei (FSM) visited the RMI to play against the top three Middle School teams in Majuro the capitol city of the Republic of the Marshall Islands. 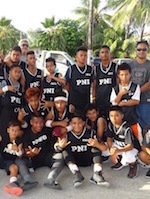 First match was between PNI and 3rd place Majuro Baptist Christian Academy (MBCA) at the College of the Marshall Islands basketball courts (SGT Solomon Sam Memorial courts). Parents, teachers and students came to cheers for their sons, friends and students. MBCA gave team PNI a hard battle to the end, fighting for loose balls, rebounds and turnovers. In the end visiting team from PNI was too strong on the boards to collect miss shots for second chance opportunities. Final score 43-39 Pohnpie win. Laura Elementary School the 2nd seed was up next against the visiting team from Pohnpei. Team Pohnpei took control from tip-off to the final buzzer. Laura Elementary School gave all they had, but PNI was too strong from both ends of the courts. PNI's defence was the main factor in this game. Final score 49-35 Pohnpei. This game played at the new basketball court in Arrak a urban village in the west side of Majuro. Majuro's Middle Schools top team MMS was next to face the undefeated visiting team from PNI at SGT Solomon Sam Memorial courts (CMI). Majuro Middle Schools (MMS) is the reigning champ from previous tournaments around Majuro. MMS always battle COOP or LES for schools tournament championship games in Majuro. Team PNI started this game on fire hitting all shots from all over the court. MMS went cold from tip-off untill the second quarter of the game. PNI was leading by 12 points in the 3rd quarter. MMS caught fire hitting 3's to tie the score going into the 4th quarter. Teams exchange leads until the final minutes of the game. Ten seconds left on the clock in the 4th quarter, Majuro Middle School with 3 points lead. PNI inbound a pass to point gaurd Kenyu Nakasone who penetrate and kick out to wide open Yuichi Nakasone for three to send the game to overtime. All the momentums was on PNI's side in overtime. PNI went undefeated by beating all Majuro's top three teams. Final score: Majuro Middle School 75 and PNI 77 in overtime.